Part of MKC's coverage of the 20th Busan International Film Festival. Step away from the city and it isn't long before you fall in with bad company or into a mystery in Korean cinema, with remote islands and mountains being among the favored haunts of the country's more macabre filmmakers. 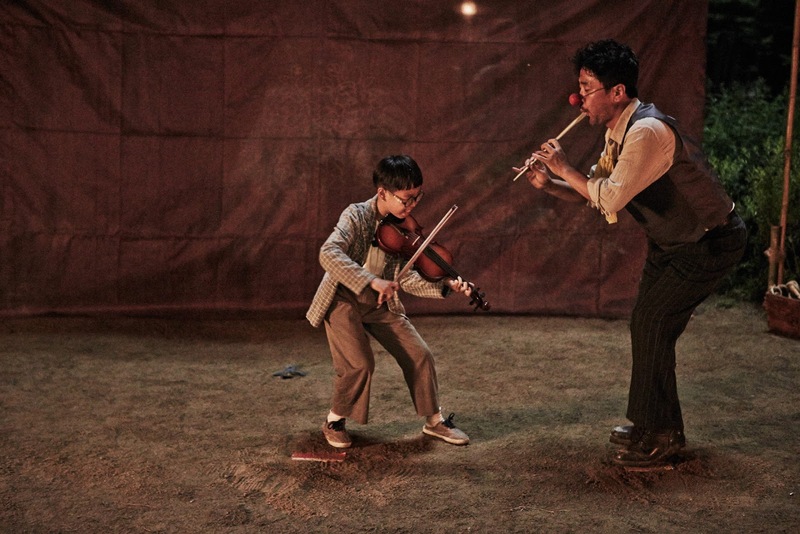 Taking its cue from a Brothers Grimm fairly tale (itself a take on an old German legend), Kim Gwang-tae's debut The Piper hums a familiar tune, yet this fable of mistrust and deceit remains engrossing and entertaining thanks to a few wicked twists. Originally a legend called 'The Pied Piper of Haemlin' from the Middle Ages that later became well known as a Brothers Grimm fairy tale, the original story features a wealthy village that experiences a rat infestation. The 'pied piper' comes to town and offers to rid them of their plague for a price, but after playing his song, guiding the rodents away from the settlement and sealing them inside a mountain, the villagers refuse to pay him and suffer the consequences when he plays his flute again to steal away their children. Kim's version takes place in the aftermath of the Korean War and sees the piper traveling through the mountains with his son. They happen upon a path that has magically opened up, indicated to us by way of a dolly zoom, and soon discover a mysterious village that looks upon these wanderers with suspicious eyes. They stick around for long enough to be accepted by the villagers but also to sense that something isn't quite right. Only then does the well-known rat element of the story come into play. Beefing up the brief tale to a 100-minute film leads to a number of twists being added to the plot, and these exhibit a Korean flair for stylish blood-letting, not to mention a penchant for drama, which heightens both the emotional resonance and macabre tone of what is already a very twisted tale to begin with. By focusing so much on the 'outsiders come to town' aspect of its story and giving us plenty of time with about a half-dozen primary characters, The Piper doesn't get going particularly quickly but the setting is an alluring one, basking in the summer sunlight and shot with an eye for clarity and detail while Kim drops enough foreboding omens along the path to keep the pace from slackening too much. Recalling the genial turns of contemporary Hwang Jung-min (Ode to My Father), as well as his own role as a simpleton in the smash hit Miracle in Cell No. 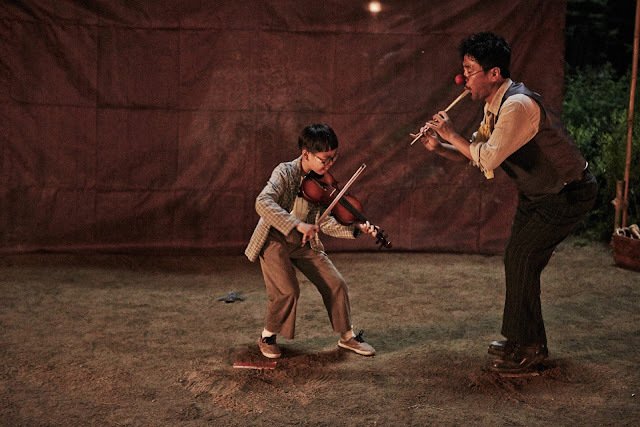 7 (2013), Ryoo Seung-ryong brings a broad smile and benevolent air to the 'pied piper', proving once again his value as a leading man with am amiable character who, caught between a terrible war and the conclusion of a tale that we know won't end well, hints at a darker side. 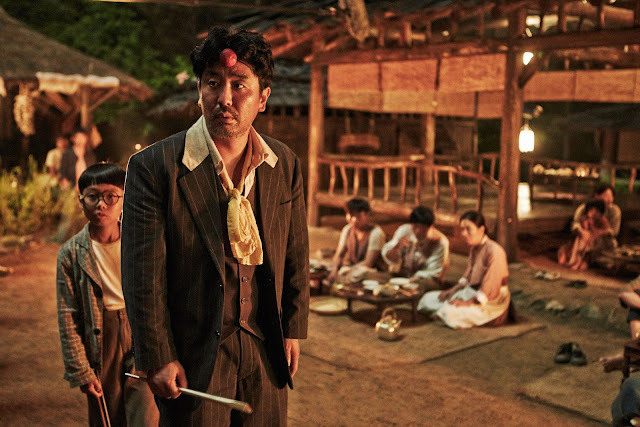 Alongside Ryoo, stoic character actor Lee Sung-min (Broken) affords a commanding severity to his village leader while Han Gong-ju's (2013) breakout star Chun Woo-hee takes her wide-eyed village girl, a relatively simple character, and plays her straight before injecting her with potent pathos during some standout scenes later in the story. Meanwhile, following his promising starring role in 2013's Rough Play, K-pop star Lee Joon (of boyband MBLAQ) is mostly consigned to the background with his angsty village leader's son whose dark edge is left unexplored. As sound and convincing as the build to the meat of the story is, The Piper is at its best in the moments that it slowly strips its characters of their humanity and foists them on to somber paths. Ultimately, the iniquity of the many actuates the gruesome retribution of the few in a final act that comes to life through striking images and which boasts a powerful and emotional climax. With a promising first feature that stands apart from its Korean peers, director Kim has marked himself as a talent to watch.